What is the special die with pictograms in Monopoly used for? It has two white dice with values 1 to 6 and one red with values 1,2,3 and 3 pictures. I haven't seen any rules that say what to do with this second die. It appears you have the Championship Edition (or the Mega Edition or some other recent modified version), which includes a "speed die" (that third die) for speeding up the game, though it's definitely not part of the original game. There are two "bus" faces, and one "Mr. Monopoly" face. When starting the game, hand out an extra $1,000 to each player (two $500s should work). The game moves fast and you'll need the extra cash to buy and build. Do not use the Speed Die until you've landed on or passed over GO for the first time. Once you collect that first $200 salary, you'll use the Speed Die for the rest of the game. This means that some players will start using the die before others. Once you start using the Speed Die, roll it along with the two white dice on your turn. Then do the following depending on what you rolled. 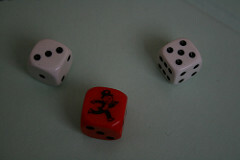 1, 2, or 3: Add this number to the roll of the two white dice. You'll zoom around the board. Bus: This lets you "get off the bus early." Look at the two white dice. You can move the value of one die, the other die, or the sum of both dice. So if you rolled a 1 and a 5, you can move 1 space, 5 spaces, or 6 spaces: it's your choice. Mr. Monopoly: First, move the sum of the two white dice and resolve the space you land on (such as drawing a card, buying the property, paying rent, etc.). Then, one of two things will happen depending on whether or not there is still property in the bank. YES, there is property in the bank -- Advance to the NEXT property that the bank still holds and buy it if you wish. If you don't want to buy this property, move to the space anyway and put the property up for auction. NO, there are no more properties in the bank -- Advance to the NEXT property on which you will owe another player money. Only the white dice are used when determining if you rolled doubles. Do not look at the Speed Die. If you roll a three-of-a-kind (all of the dice show the same number), you can move anywhere you want on the board! If you get sent to jail during your move (either by landing on the "Go to Jail" space or by rolling doubles three times in a row) then your turn is over and you do not get to use the Speed Die for that turn. Use the white dice ONLY when rolling to get out of jail. Use the sum of all three dice when determining how much to pay on a utility. Note: The Bus and Mr. Monopoly are valued at 0. @Cascabel's answer has the rules from the championship edition for this die. Mega Edition has different rules (especially surrounding the bus symbol). The mega edition rules are compatible with a regular monopoly set if you add 16 bus tickets. To make your own, you need 13 regular ones and 3 that say "all other tickets expire"; the two types of bus tickets should be indistinguishable when face-down. You could just use playing cards (taking 13 diamonds to be regular bus tickets and 3 spades to be the "all other tickets expire" tickets). Those rules are included below. Regardless of which edition you are using, the speed die does make the game shorter, both in making properties get bought faster then in causing players to go bankrupt faster. It does also somewhat radically change late-game strategy due to the behavior of the Mr. Monopoly symbol once all properties are bought (move to the next property where you owe rent). 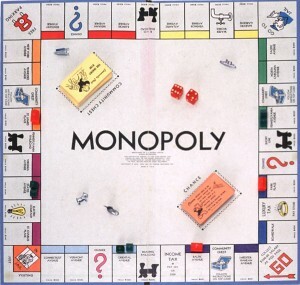 This rule allows a player to augment the likelyhood of other players landing on a heavily developed property by buying a contiguous block of the preceding properties and mortgaging them all (thus making the developed one the next place another player would owe rent for a large chunk of the board). This also increases the value of railroads and utilities as potential "spoilers" in these runs of mortgaged properties. On your turn, roll all THREE dice: the two white dice plus the new SPEED DIE. • If pips appear on all three dice, simply move the total of all three. • If you roll a Mr. Monopoly, you get a bonus move. First, move according to the white dice, do what you would normally do on that space; then move again to the next unowned property, which you may now buy. If you roll a Mr. Monopoly after all of the properties are owned, make a normal move according to the white dice, then move ahead to the first property on which you need to pay rent. If all other players properties are mortgaged, stay where you are.Note: An opponent can’t build or trade until your Mr. Monopoly move is completed. Refer only to the white dice when determining doubles. If doubles entitle you to roll again, you may use a Bus Ticket in place of rolling the dice. While in JAIL, roll only the two white dice (if you pay beforehand to get out, roll all three dice). If you roll TRIPLE 1’s, 2’s, or 3’s, move ahead to ANY space on the board. Do not roll again. You do not go to Jail if you’ve rolled doubles twice before rolling triples. On any turn, you may choose to use a Bus Ticket (if you have any) instead of rolling the dice. If so, move forward to any space on the same side of the board. (Corners are the final space on each side, as well as the first space of the next side.) After using a Bus Ticket, give the Ticket to the Banker,it is out of play for the remainder of the game. (There are 16 tickets in all. When they are gone, they’re gone!) Watch out! When an “All Tickets Expire” card is drawn, all other Tickets in the hands of the players are lost to the bank (they’ve expired). If a Bus Ticket or Mr. Monopoly roll causes you to pass GO, collect $200 as usual. Note: All Bus Tickets should be revealed as collected and kept face up. Not the answer you're looking for? Browse other questions tagged monopoly dice or ask your own question. What are the order of actions in Monopoly? Are there any dice games you can play with a standard 7-die set? What game is this die from? What is the Monopoly M Symbol called? How is the die for Cat Tower configured? What is this die for? Does this have an official name and rule set? Where do you go for the 'nearest railroad' in Monopoly? What board game is this die from?